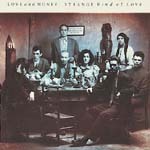 Love And Money formed out of Glasgow-based 'Friends Again' in the early eighties and whilst their debut album 'All You Need is...' hinted at the funky tunesmithery to come it wasn't until 1988's 'Strange Kind Of Love' that the band and, moreover, tunesmith James Grant made their critical mark. The second album had added production sheen from erstwhile Steely Dan producer Gary Katz and it showed, giving Grant's songs added gloss and impact. The album featured a shedload of standout songs including the title track, and the sublime 'Walk The Last Mile' (Grant later reprised this for the CD single 'Pray The Dawn' (1998)). I remember catching the band at a University gig in Liverpool during their promotional tour for the album, in November 1988; they had arrived late and the sound system was abysmal, but they struggled on regardless, the strength of the songs shining through. The album, which shifted quarter of a million copies, was supposed to lever the band for greater things. However, Phonogram couldn't hear many singles in the works that followed. The follow-up album was always going to be difficult without Katz's gloss, and although 'Dogs In The Traffic' contained some memorable songs it wasn't up to its predecessor's consistency and it seems Grant was turning away from abject commercialism to something altogether more dark and broody. The band's own-label swansong 'Little Death' in 1994 was more of a Grant solo effort, and decidedly low-key. In fact, a melancholic strain permeates his later solo work. In the nineties Grant maintained a low profile, producing and sessioning for several Scottish acts during the period (including Capercaillie's Karen Matheson) and seemingly undergoing a personal hiatus. He emerged with the two solo albums 'Sawdust In My Veins' (1998) and 'My Thrawn Glory' (2000) which restored his superior way with words and, whilst remaining low-key, would go some way to satisfying those who admired his craftsmanship. Grant also plays a pretty mean, if tastily understated, guitar. A new solo album, 'Holy Love' was released in October 2004. Karen Matheson, Time To Fall (Vertical VRTCD002, 2002) James Grant first contributed to a Karen Matheson solo album in 1996, but this album from the Capercaillie singer includes six Grant compositions as well as instrumental back up on all tracks. Corrected year of release for Strange Kind Of Love and promotional tour date. © 2000 James Grant/Vertical Records. All rights reserved.